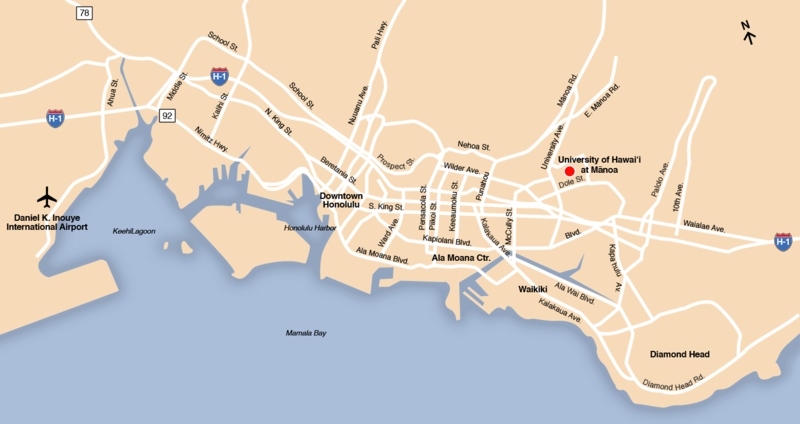 The University of Hawaiʻi at Mānoa is located in lush Mānoa valley, on the main island of Oʻahu, approximately 8 miles from Honolulu International Airport, 4 miles from downtown Honolulu, and just 2.5 miles from world-famous Waikīkī. The campus is easily accessed from the H-1 highway. Our map indicates the most common campus destinations, including the Admissions and the Financial Aid offices (both located in the Queen Liliʻuokalani Center). You can also print a map (pdf). Limited metered parking is available on Varney Circle, however you may be directed to an alternate parking location. For parking locations and policies, visit Commuter Services. If you are a prospective student interested in attending UH Mānoa, please visit Undergraduate Admissions to schedule a campus tour. Known as TheBus, the Honolulu city bus stops on campus at Sinclair Circle and other nearby locations. Visit TheBus for schedules and fare information. Visit the Hawaiʻi Visitors and Convention Bureau for hotel information or check these special hotel and inter-island airfare deals.